* Released in 1996, A*Men packs a punch as an intense gourmand with the trio of cocoa, caramel, and chocolate. * The new Taste of Fragrance adds chili pepper to the mix, which increases the heat. * Not the first remix of A*Men, previous Pure incarnations have featured coffee, tobacco, and malt. * The Taste of Fragrance is quite linear – what you get on top is what you get throughout the journey – strong brisk coffee with chili in the forefront and cocoa underneath. * Quite long-lasting, this will last through a shower and wake you up again in the morning. * The other Thierry Mugler fragrances – Angel, Womanity, and Alien are all updated with a new Taste of Fragrance as well this season. The fig chutney of Womanity is especially unique. * Apply lightly, A*men fragrances are strong and project greatly. You will defintely be making a statement. 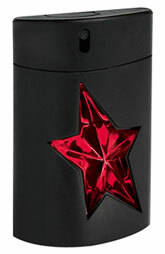 A*Men The Taste of Fragrance is available from Nordstrom and other retailers. For more information about Thierry Mugler fragrances , check out their website. This was an exceptional fragrance collection. I HATE that it is limited edition. Why do they do that? I guess because they have limited space in retail spaces – and they would have too many flankers. Love my bottle of this, it was a gift from a great friend ! What a thoughtful friend that you have.